I recently purchased a bottle of wine at auction on a whim... the subject was a non-vintage bottle of a Spanish varietal that I rarely, if ever, see as a single-varietal in this part of Western Canada: Macabeo. I knew very little about the varietal other then it's use in northern Spain for one of my favorite sparkling wines; Cava. So I bid, I won, and I took it home. The bottle was very inexpensive and I thought to myself "Meh. How bad can it be?" Turns out, it's brilliant. So brilliant that I saved my last half-glass in the fridge for over two weeks, and even without vacu-vin, it's still superb. How can this be you wonder? Well let me tell the tale~! Spanish winemakers have had a rough go of it for decades... only just recently have they come back into favor. And so in Calatayud, northern Spain, in the 1950's banding together was really all the little producers could do to stay afloat. Hence the creation of the Virgen de la Sierra co-operative in 1954. 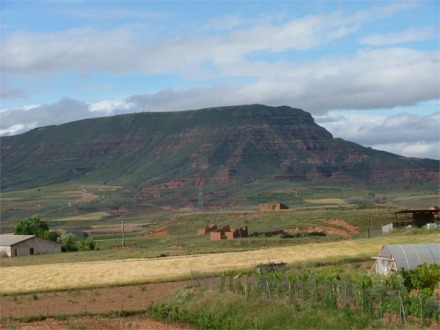 They have 579 members, and fight to produce quality wine in a place that for many people must look barely inhabitable. Not so to the grapevine~! This stony, loose soil - so poor in nutrients - is perfect for the grapevine. Not only does it not mind that it has to find moisture, it loves it. 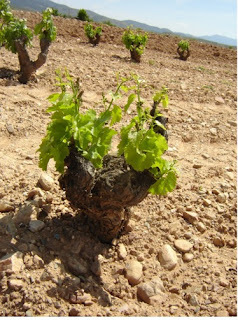 Remember that; grapevines are like people... always thriving because of challenge, not despite it! Anyways. This stony soil is quite loose, which allows the vines a bit of an easier time to push down, down, down to the iron-rich deposits below and the sacred water. In fact, it was the local name for the dry creek-beds that gave the name to this wine: Yasa. These vines thrive, and find all that they need in the dry and dusty high-altitude valley. Just look at this vine, bent with age... no machine has ever touched it - this is entirely worked by hand and has been for decades. The average age of the Macabeo here are over 50 years... and whilst many New World producers would charge dramatically higher prices because of the vine age, this co-op does not. And they have my thanks for showing me what this brilliant little varietal is capable of! I've discovered that the best white Riojas which sell for upwards of $100 or more in my market, are made with top level Macabeo and aged sometimes for decades (I have one in the cellar right now from 1991). But then, why am I surprised? This is the age of the wine-consumer; never before have we been able to enjoy such quality, such diversity, and at such extraordinarily low prices. True enough, there is mass-produced, chemically-enhanced, bag-in-a-box swill as never before, but for those willing to look in dusty corners, and try something other then the norm - treasures abound! 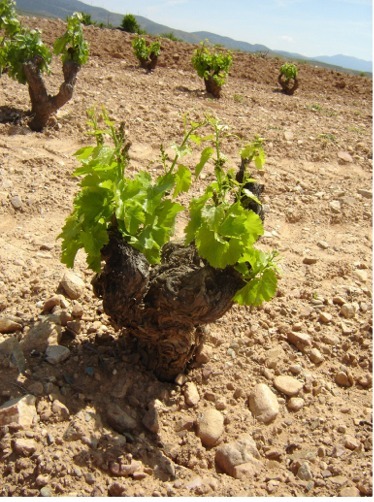 The co-op winemakers of Calatayud display quality and precision in their winemaking. They also display a high level of honor in how they treat their land, their vines. These are the types of winemakers who excite me and make me want to try more! And when they hawk their wares for a more then reasonable price? Then I'm willing to try just about anything they care to sell. FOOD PAIRINGS: crisp acids call for some fat, and the minerality with play off seafood. Consider Oysters rockefeller!!! The above mentioned is self-explanatory, but the bacon in a good Rockefeller will bring the savory qualities out from the wine and make it even more like a northern Rhone white then it already is. And so, from this quiet part of northern Spain comes a value wine that truly has value. And so much of that part of Spain is in the wine: it has kept it's bright acids because Calatayud is a continental climate: they have hot summers, cold winters, but above all they have a marked change in temperature from day to night. Hot summer days and cool summer nights preserve the acidity in wine. The soil I can still taste, and find impressive in such an inexpensive wine. But then there is the last part of what we call terroir that I can't explain, not yet. That is the people... but I dearly want to meet the people who work so diligently to coax wine from old vines in a parched part of the world. Yes, I want to meet those people and shake their hands.